One of the surfaces to be joined is coated with a mixture of NOCOLOK® Flux and metallic Si powder. The coated assembly is then heated in the same fashion as in conventional furnace or flame brazing techniques. As the temperature rises, the flux melts at 565°C, dissolving the oxides on both the Al substrates and the Si particles. The bare Al surface is now in contact with metallic Si, and in the absence of oxides, allows solid-state inter-diffusion of Al and Si. Very quickly the composition near a Si particle reaches that of the Al-Si eutectic (Al-12.6% Si). As the temperature increases beyond the eutectic reaction temperature of 577°C, the formation of a liquid pool is established. The formation of the liquid leads to rapid dissolution of the remaining Si through liquid diffusion. The pool of liquid continues to grow, consuming Al, until all of the Si is consumed in the melt. In the presence of a joint, the liquid pool is drawn to the joint by capillary action. 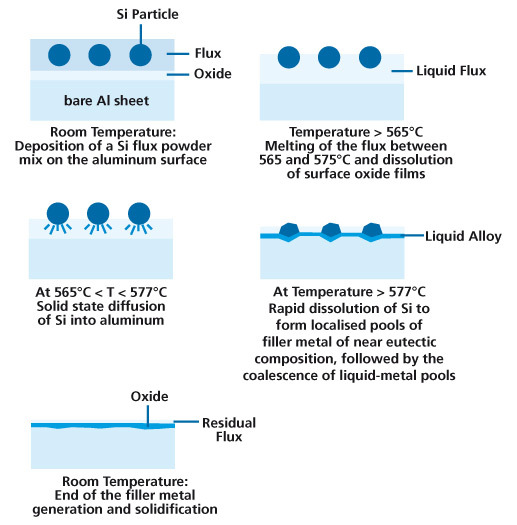 Upon cooling, the liquid layer solidifies to form a metallurgical bond between the components. b) alternatively CsAlF-Complex flux (melting range between 420 and 480°C) and Zn-Al filler alloys. Regarding a): Brazing of aluminum to stainless steel works both with NOCOLOK® Flux + Al-Si filler alloy and with NOCOLOK® Sil Flux. After the flux melts and the oxides are removed, there is a reaction between Al and Fe, forming a thin intermetallic layer of FeAl3. This layer forms the metallurgical bond between the Fe and Al components. FeAl3 is very brittle and thus the thickness of this layer should be minimized, otherwise the joint can easily fracture. From a metallurgraphic point of view, there is a multi-layer system (microscopic structures). First, there is the stainless steel, then the layer of FeAl3, then the Al/Si filler metal, and finally the aluminum base material. The thickness of the brittle FeAl3 layer is a function of brazing time and temperature; – consequently the need for a short brazing cycle with fast heat-up and very short holding time at maximum temperature. Too high brazing temperatures must be strictly avoided. Only with a short brazing cycle, successful joining of aluminum to steel is possible. Joining of Al to steel using NOCOLOK® Flux is done on large scale commercially for the production of pots and pans (stainless steel pots with aluminum ‘compensation base plates’) – mostly in induction brazing. It is also used for the production of heating elements (steel heating plates with aluminum base plates and tubes for the electrical heating wires). Another application for aluminum to steel joining is brazing of large aluminum-plated steel tubes – up to 11 meters long – with aluminum fins for power plant cooling modules. 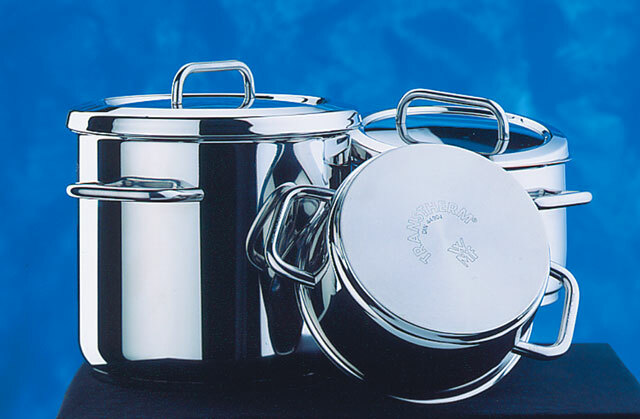 In the manufacturing of pots and pans where there is a large surface area between the Al base plate and the pot, a mixture of filler metal powder and flux is often used. This circumvents the use of filler metal shim stock which is said to be costly and difficult to implement. In Al tube to steel or stainless steel tube joining, conventional flame brazing techniques can be used. Filler metal wire, either pre-placed or fed into the joint must be used. In the production of power plant cooling modules (with aluminum-plated steel tubes), the filler alloy is provided by clad fin material.